ORACLE @ Work: MSSQL Server: The tail of the log for the database "DATABASE" has not been backed up. MSSQL Server: The tail of the log for the database "DATABASE" has not been backed up. System.Data.SqlClient.SqlError: The tail of the log for the database "DATABASE" has not been backed up. Use BACKUP LOG WITH NORECOVERY to backup the log if it contains work you do not want to lose. Use the WITH REPLACE or WITH STOPAT clause of the RESTORE statement to just overwrite the contents of the log. 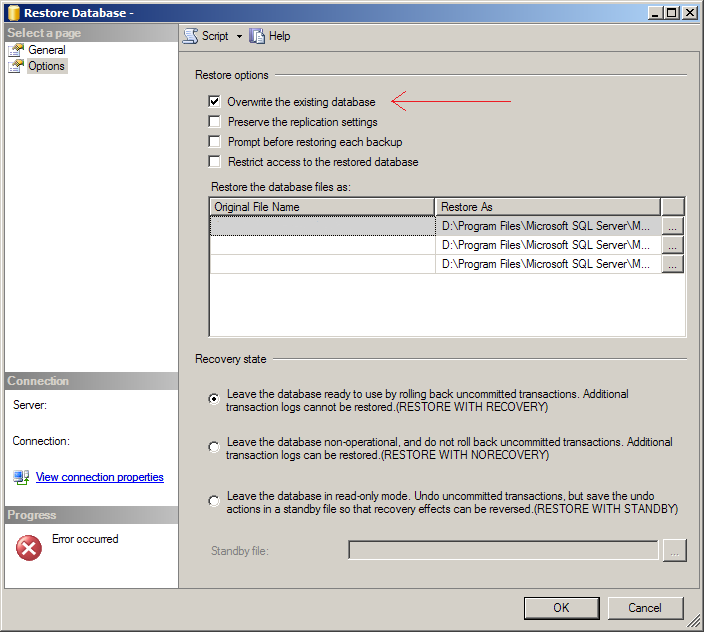 Select "Overwrite the existing database" from Restore option. This will overwrite the tail of of database log , as my DB is corrupted and wanted to restore from last full backup so it's fine for my case.